My daughter's birthday will be coming up soon and I was thinking about what kind of birthday cake to make for her, taking in her suggestions. I then realized that I didn't post the last birthday cake I made. Some months ago, my youngest celebrated his birthday. I tend to make my kids birthday cakes (that is until they prefer me not to anymore). I'm not the greatest baker or cake decorater but I give it my best shot. 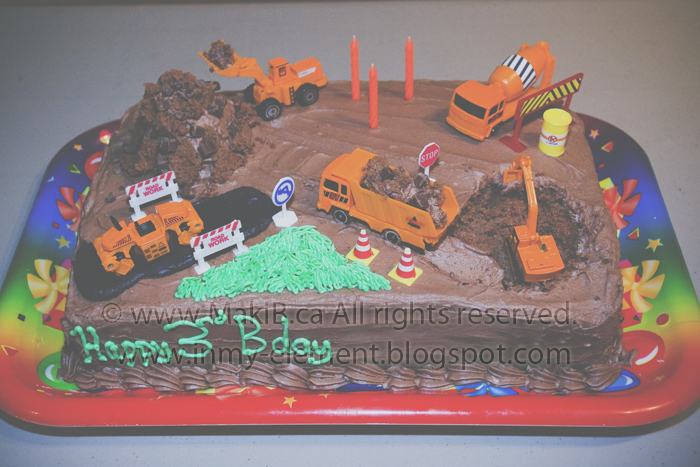 Last year, he started his love for construction and that his why I made the dump truck cake. I thought as the year went on, he'd be into something else but that didn't happen. He loves construction even more. So I came up with this idea. This was easy and he was pretty excited to see it. What spoiled kids I have. But I love doing it for them. In large bowl, beat butter with sugar until fluffy. Beat in eggs, 1 at a time: beat in vanilla. In separate bowl, sift together flour, cocoa, baking powder, baking soda and salt. Stir in butter misture alternately with buttermilk, making 3 additions of dry ingredients and 2 of buttermilk. Bake at 350F for 30-35 minutes. ** Cool on racks for 20 minutes. Remove and let cool completely on rack. Cut cake horizontally into 2 layers. ** I used a 9x13 cake pan instead. You will have to adjust your baking time for longer, at least another 15 minutes or until toothpick comes out clean. Recipe from: Chocolate layer Cake, The Complete Canadian Living Cookbook. Cream margarine. Add sugar gradually beating on medium speed. Icing should appear dry. Add milk & chocolate and beat until fluffy.